Recently, in the process of collecting IEEE 2018 papers, the paper “A Scalable and Extensible Blockchain Architecture” co-authored by Ultiledger Founder Ran Liang, Core Development Yue Yu and Jiqiu Xu has stood out from thousands of papers worldwide and was officially included in the IEEE. As the world’s largest professional technology organization, IEEE has published 30% of the world’s similar literature in the fields of electrical and electronic engineering, computing, communications, etc. At the same time, the IEEE also publishes professional technical journals in the fields of electrical engineering, communication, computer theory and methods, with a total of more than 140 volumes. In conjunction with academic exchange activities in various professional and technical fields, IEEE also provides more than 700 publications including journals, technical newsletters, conference proceedings, and journals. The paper analyzed the advantages and the existing pain points of the blockchain, and it presents a method to build a scalable and extensible blockchain system by multiple chains and sharding techniques. The multiple chains and sharding, how to extend the multiple chains and sharding, the main chain witnesses the sub-chain transaction, and the Cross-chain trading through the value exchange layer. This architecture ultimately provides a new way for the new blockchain system to achieve high scalability and flexibility. 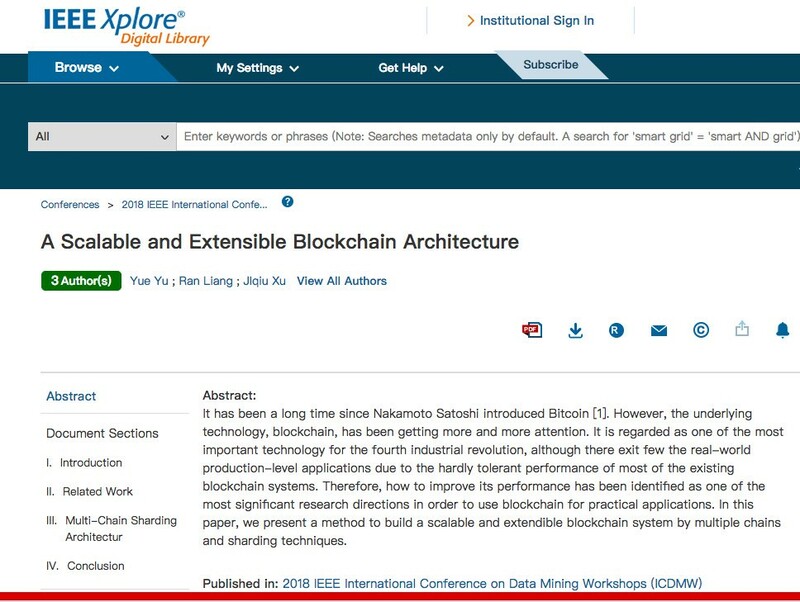 The details of the paper “A Scalable and Extensible Blockchain Architecture” can be found on the IEEE literature website. Ultilegder, the Next Generation Global Self-financing Blockchain Protocol, an open source protocol initiated by a number of IT technology geeks, gets a high-level consensus and co-governance from the communities. Ultiledger aims to build an economic and financial ecosystem based on token ULT to help any organization (contains government, business, industry clusters or individuals and communities) that needs to build trust at a low cost and rapid construction of a distributed financial book and account system of bank-grade security; zero-cost transaction settlement within the ecosystem; improved security, privacy, efficiency and capital availability of the system through the combination of the main chain and sub-chains. In the Ultiledger ecosystem, any tangible assets, data or intangible rights can be written on blockchain to become a string of code to achieve assets and data tokenization, and to use smart contracts and distributed storage for completing functions such as confirmation, notarization, trading, circulation, etc., and finally achieving “credit circulation, asset circulation, value circulation” in the algorithm world. At present, the Ultiledger ecosystem has been implemented in the field of supply chain finance, and it is the first innovation in the blockchain wave. The Ultiledger sub-chain has successfully applied in many domestic listed companies, including the Dawn Group (002838), Saturday Shoes (002291), and the 365 Group.